Here are the new episodes featuring the newest members of the Rugrats cast -- Kimi, Kira, Lulu & Fifi. These episodes are also part of a year-long celebration celebrating the Rugrats' 10th anniversary on Nick. Beginning with this season, most episodes will have 3 stories -- one the original 11-minutes in length, and 2 shorter ones, of varying lengths, as little as 2 minutes. And of course, Canadians saw most of these episodes first on YTV. At the Finsters, Stu builds a treehouse for Chuckie, Kimi, and the other Rugrats to play in. After Kimi took Cynthia from Angelica (without asking, of course) to play in her treehouse, the Rugrats imagine Angelica as if she was a monster from the jungle, a la "King Kong". 1. In Canada, this episode is the first TV appearance of Kimi, Kira, and Fifi. As for Fifi, the French poodle, she apparently became the Finster's family pet, though how it became so was never mentioned; yes, she appeared stateside at the end of Rugrats In Paris, but the situation leading up to her emigration to the states was never shown or mentioned. 2. This episode also introduces an all-new version of the Rugrats intro, featuring appearances of all Rugrats, including Susie, Dil & Kimi; plus a revamped version of the theme song. Until now, Peter Chung's introduction was the same since 1991, with only Tommy, Chuckie, Phil, Lil & Angelica featured. Dil's pacifier travels around the neighborhood, after it drops out of Dil's mouth. When Chuckie is afraid of the same things that Kimi likes, he fears that he isn't such a good big brother to her. Meanwhile, Chazz & Kira start making plans for a new business venture -- a coffee house. That coffee house will become reality when it opens in The Fun Way Day episode. This episode picks up where Rugrats In Paris has left off -- with the entire gang now back in the good old US of A, with Chazz a newly-married man, and, most importantly, Chuckie gaining a new mother and sister that he likes. But if you think that the Watanabe-Finsters are going to be in a total state of bliss from now on, think again -- as long as there's Angelica, there cannot be total bliss. And who else but Angelica would put a damper on Chuckie's happiness? While Kira studies for a fairy tale play (which involves Cinderella), Angelica tries to trick Chuckie into thinking that he'll be living the same life as Cinderella -- virtually being a slave to Angelica and Kimi, while everyone else gets ready for a party that will celebrate the newlywed couple's adoption of each other's child, a couple of weeks after their marriage. 1. In the US, this 30-minute episode is the first TV appearance of Kimi, Kira & Fifi. 2. This will also be the first episode to have the new intro, for US viewers. 3. This episode also introduces a new topic -- adoption; however, it's done with a little twist -- Chazz and Kira formally adopt each other's children. First of all, when a TV program deals with adoption, it's usually where a married couple adopt a child that needed both parents. Second, this situation is nothing like The Brady Bunch, where Mike & Carol, each with 3 children, married, then went their happy way. 4. Note that Chuckie's room is back to where it was before the change in Chuckie's Bachelor Pad, with the rainbow and the sun painted on the walls. 5. Also note that in the house, everyone is wearing only socks on their feet -- this is due to Japanese custom that everyone takes off their shoes when they enter a house. The only ones in the house not seen with socks only were Tommy (who's always barefoot) and Angelica (who left her shoes on). 6. Also, beginning in this episode, Chuckie starts to talk to the grownups, but can only say one word -- "no". Those who saw Rugrats In Paris will understand. 7. When Kira is reading her script for the play, note that she's turning the pages from left to right; this is how the Japanese read their books, magazines and newspapers -- their publications are designed to be turned from left to right. However, unless you're watching the Japanese, Chinese, Hebrew or Arabic version of this episode, this action is an error, as the play is in English (or French, or Spanish, or Italian, etc. ), and the publications usually have pages that turn from right to left. 8. For viewers in countries that play the episodes in production order (such as Canada), you may find that the treehouse, built in Angelicon, is missing. This is due to the fact that Finsterella is designed to be seen as the first new episode after Rugrats In Paris, even though it was the fourth episode in production order. 9. On some stations in the ET and CT time zones, Finsterella was the first episode on Rugrats' regular run on CBS, when the Nick on CBS schedule was changed on 2/1/2003. However, many stations that scheduled the program after 9AM ET were not able to carry that episode that day, due to breaking news regarding the breakup of Space Shuttle Columbia over the Dallas / Ft. Worth area, shortly before its 9:16AM ET landing. (Stations that showed it at 9AM ET had it permanently interrupted after the first few minutes, as CBS stations joined continuous coverage of the event.) Because of this, many stations did not start showing Rugrats until 2/8, when Be My Valentine is seen. When Stu started using a picture of Dil on his computer, the Rugrats thought that it is Dil himself who's trapped in there. Because of this, they treat the computer the same way they treat Dil -- like a baby. Meanwhile, Lulu & Grandpa come over to babysit the Rugrats -- including the real Dil. After Phil & Lil knock over a blueberry pie that Didi baked, they make a new one, with the usual "different" ingredients. Angelica is told not to eat the big cake that her mom has baked. But when she ate the whole thing without getting sick -- things happen. At an amusement park, Angelica, now the only only-child in the series, feels left out when she had no brother or sister to join her in a novelty photograph. After Drew mentioned to her that they aren't ready to have any more kids, she starts looking for someone who would make a good brother or sister for her. When the Rugrats notice that Spike is having a nightmare, they help Spike out of it by giving him the things that help them through their nightmares. Spike's nightmare involved the turkey from The Turkey Who Came To Dinner. At Edwin's birthday party, Kimi falls in love with the donkey piñata at a party, thinking that it was a "Cuddle Bunny". But when she learns that the kids will bust it open for the candy inside, the Rugrats try to save Cuddle Bunny from its impending destruction. 1. Wasn't that done before in an episode of Johnny Bravo, where he tries to save all things animal, including the Piñata? 2. It was mentioned in this episode that the Rugrats knocked down a piñata before, referring to what happened in the Angelica's Birthday episode. Stu has bought a new pair of shoes. But when they clash with his suit, squeak when he walks, and hurt his feet, he rants and raves, complaining that they are "the worst shoes ever worn by a human". Overhearing this, the Rugrats figure out ways to save Reptar, Stu, and themselves from this pair of "bad shoes". Most retailers let you try on the shoes and walking in them before you buy them; if you don't like them, put them back and choose another size or style. Apparently, Stu did not heed this advice, and bought the shoes directly off the rack before giving them a try first. From their perspectives, Spike looks at a vacuum cleaner, while Dil looks at bubbles. While repairing the sprinklers, Stu accidentally breaks the water main, forcing Didi, Betty, Colleen McNulty and Jonathan (for Charlotte, of course) to go to the laundromat to do their laundry. It was a good place for the Rugrats to watch the front-load washers like they're watching TV (a la Zippy The Pinhead), but when the Rugrats encounter the McNulty boys, trouble ensues. In a tribute to West Side Story, they fight over their "turf" in this musical episode, while Angelica looks for her missing Cynthia, and Jonathan complains about doing Charlotte's laundry, mentioning that working at a fast food joint is more rewarding. 1. The official spelling of the title is "Wash / Dry Story", but, to avoid confusion in my TV schedule (where I use slashes to separate story titles), I respelled it as "Wash-Dry Story". 2. In Nick US' schedules, the episode is titled "Wash And Dry Story", which eliminates the title's joke value, as "Wash-Dry Story" is a play on "West Side Story" -- "Wash And Dry Story" makes no sense, other than merely suggesting that it has to do with laundry. 3. Effective 6/3/2002, Nick US replaced Falling Stars (which normally follows Dayscare & The Great Unknown) with this story, due to circumstances known only by Nick's programmers. In addition, Wash-Dry Story still remains paired up with Bad Shoes and Dil & Spike. To help expand their minds, Chazz and Kira send their kids to the Happy Clown Daycare Center, endorsed by Dr. Lipschitz. Angelica informs Chuckie & Kimi that daycare can be dangerous, as it's where the "scary kids" go to play. When they got there, Kimi ended up having a ball, while Chuckie would rather hide in balls. This isn't the first time Chuckie wen't to daycare, as we found out in the Chanukah episode. The Rugrats set their sights on a staircase post, where it hides one of the Rugrats' greatest mysteries -- why does it wobble? The gang are at the park at night to watch the stars fall. 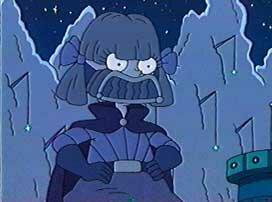 In a fantasy salute to Star Wars, the Rugrats try to keep the stars from falling by fighting the Darth Vader-like force, Angelica, that causes this phenomenon. 1. On Nick in the US, all telecasts of this episode after 6/3/2002 had Wash-Dry Story shown instead of Falling Stars, for reasons unknown. TV listings, however, still include Falling Stars in their listings. The last time Falling Stars was televised on Nick in the US, according to my schedule records, was on 7/30/2001. However, it wasn't totally banished from the US -- Falling Stars is included on the Christmas home video, which was released in 2002. 2. I take it that it was a cool night, as everyone was wearing sweaters, jackets and pants, but why was Tommy barefoot and wearing no pants? Don't you think he'll catch a cold? Since Kira & Kimi came into Chuckie's life, he believes that everything is changing when Kira straigtens his hair, buys him new "trap-door" pajamas with feet, gives him sandwiches with crusts, and, worst of all, gives Wawa a makeover. The Rugrats discover the first thing about magic when they sneak backstage at a magic show at the local park. The whole family is at the retirement home, visiting Grandpa and Lulu. While Grandpa shows the adults around, Lulu babysits the Rugrats; but once she's distracted, the Rugrats wreak havoc all over the place. Animation error: In the bingo hall scene, the call board (where the called numbers are displayed), only has single digit random numbers, instead of the usual bingo fashion. Also, on the wall, the ace of spades is red, instead of black. 138 (01-08A) [N135A] Cat Got Your Tongue? Howard has laryngitis, making it difficult for him to speak. When Lulu asks if his "cat got his tongue", the Rugrats look for Fluffy, so they can get it back. After Grandpa told the Rugrats one of his war stories, the Rugrats rescue Dil's bottle as if they're at war. When Kira & Chazz felt that Kimi is homesick for France, they throw her a party and shower her with gifts, all with a French theme. However, by doing so, they ended up not giving Chuckie any attention. Angelica & Susie compete in a talent show, with Angelica having the usual unfair advantage, thanks to a little spying, trickery, and Charlotte's usual connections. At stake -- a trip to Cynthialand. Also in the show -- Grandpa & Lulu's dance act, provided that Grandpa's trick back doesn't get in the way. The premise of the story is similar to a story in V.3 #4 of Rugrats Comic Adventures, "Call Of The Cookie", though that story involved Angelica & Susie selling cookies for their scout troop. While Stu works on his latest robotic invention, Didi notices that Tommy likes baths, but Dil does not. While she gives both babies their baths, a fantasy sequence reveals the answer -- Dil imagines that he's sailing in the rough ocean. Chuckie accidentally had his toy airplane jammed inside the toilet, which motivated Chazz into getting a new one to replace it. While the folks are shopping at a home improvement store, the Rugrats think that an entire army of toilets are out after them, to seek revenge for what Chuckie did to one of them. When Angelica breaks her mother's cell phone (so she thinks), she hides it in a drawer and keeps it a secret. However, when she is unable to reveal the secret, it drove her nuts. This isn't the first time Charlotte's cell phone breaks, as it happened at least twice before -- in Moving Away, Charlotte broke the phone's antenna in a fit of anger; and in The Rugrats Movie, she chucked it into the river when she was reunited with Angelica. Angelica has gotten a new Cynthia watch, which she uses to trick the Rugrats into believing that they must do whatever the watch says. Basically, the watch "tells" the Rugrats to become Angelica's slaves. Then, on the way to get a snack, Angelica's watch slips off her wrist. Kimi finds it, but hides it away, so that Angelica wouldn't order the Rugrats around anymore. However, they think that time stops as long as the watch stays lost, meaning that Angelica stays around forever and ever. Meanwhile, Stu works feverishly to beat the deadline on a new shoeshine machine, saying that he has no time to spend doing anything else. When Angelica decides to play "business luncheon", the Rugrats wanted to play too. However, Angelica told the Rugrats that they can't play unless they're able to wear grown-up clothes, tell jokes and not wear diapers -- her idea of growing up. 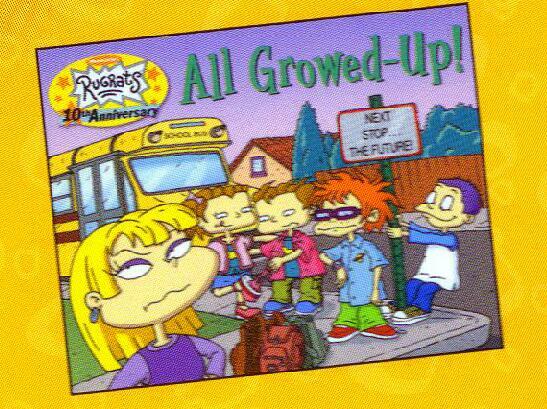 Susie tries to make the Rugrats grow up, so they can join Angelica. Tommy explains to Dil how the fridge, the toilet and the playpen work. In celebration of a Japanese holiday, Kira wants to send her parents a package of special mementos of Chuckie and Kimi. However, Chuckie heard it as if Kira wanted to send Kimi to Japan. Chuckie and friends tries to make Kimi's last day in America pleasant. Phil watches "Adventure Squad", a super-hero show that becomes so intriguing, that he tries to make all the Rugrats' imaginary adventures involve the "Adventure Squad". While it seemed great at first, the rules of the game, along with Phil's reluctance to play anything else, begins to take a toll on the other Rugrats. Tommy talks to Dil about the things in the backyard, like grass, the lawn mower, Spike's doghouse, even Spike's "poopie". Angelica recently received a Cynthia talk show outfit, while Kimi got one of those toys that you push beads along pipes. While the other Rugrats were getting ready to play "talk show", Chuckie wanted to play with the other toy, but broke it after tripping on it. Afraid that he'll make Kimi sad, he hid the broken pieces away. Angelica, however, saw the broken pieces, and organised a talk show on the Rugrats' most intimate secrets, just to find out who broke it, as well as entertain herself with a recording of an angry, upset Kimi on tape. In this half-hour holiday special (which debuted in Britain 8 months early), the Carmichaels get a visit from the "Great Aunt T" (voiced by Irma P. Hall), who came over to celebrate Kwanzaa with the Carmichaels. The holiday, which the Carmichaels normally don't celebrate, celebrates the honor and greatness of the African people. However, Susie feels that she isn't as great as her brothers and sisters, all of them examples of greatness in the Carmichael family. With a little help from the Great Aunt T. and the Rugrats, she learns that everyone is great in their own way, making "Kwonzo" a joyous holiday. We also go back in time, when Aunt T met Dr. Martin Luther King, Jr. in the most unusual place -- at the side of the road with car trouble, as well as the time Aunt T funded Lucy's tuition money for Harvard Medical School. 1. For the unitiated, Kwanzaa is, according to Edwin, "...a cultural holiday established in 1966 commemorating the first harvest celebrations of Africa." Kwanzaa is a time when blacks give thanks and honor the legacy of themselves. Kwanzaa is usually observed right after Christmas. 2. This special, though already televised in Britain, was released direct-to-video in the US & Canada on 9/25/2001 (though it wasn''t until November before most retaillers stocked this video). Its North American English TV premiere in the US will be on 12/11/2001 on Nick. As for Canada, it premiered on Vrak.TV in French on 11/24/2001 (also the North American TV premiere); YTV will carry the special in English on 12/26/2001 at 8AM ET & 6PM ET. 3. This episode also starred Kevin M. Richardson, who was the voice of Dr. King. He was the voice of one of the sumos in Rugrats In Paris. Also, Bill Cobbs appeared as the voice of Aunt T's husband, Uncle Charles. 4. A 12-member choir provided the voices in Lucy's church choir flashback, though apparently, they're not affiliated with a church, as none was listed in the credits. 5. Near the start of this episode, Aunt T mentioned that the storm in the Carmichael's neighborhood reminded her of Hurricane Coco in Tahiti. This may be an indirect reference to Coco LaBouche, who was the tyrannical manager of Euro Reptarland in Rugrats In Paris. 6. Anachronism error: It is this episode where Alisa gets her first cell phone, for emergencies only; but in the No Place Like Home episode, she already had a cell phone, yakking away, of course. 7. As with the Be My Valentine and Discover America episodes, this episode had its North American debut in French, on Vrak.TV. However, when this episode was first shown on that channel, the last 10 seconds of this episode was cut off by a commercial, right in the middle of Susie's toast. Also, the choir number was in English, with original voices, though the non-singing dialogue preceeding the song was in French (not a mistake -- just pointing it out). 8. Vrak.TV wasn't the only one to make a mistake with "Kwanzaa". Nick (US) goofed with the closing credits three times -- on the premiere 12/15/2001 telecast, they presented the closing credits to All Growed Up by mistake, running on one side of the screen while promos play on the other side. In the 12/26/2001 repeat, they shown the original credits through "Voice Director", before switching to split screen credits, where, once again, the credits for All Growed Up were used, starting with the voices. And in the "Kwanzaa" video, the cast of that special was included, but Tara Strong was listed twice as Dil, under her current name and her maiden name (Charendoff); I should point out that Dil appeared in the other stories in the video following "Kwanzaa", not "Kwanzaa" itself. Also, Rodger Bumpass was credited as Uncle Freddy (who appeared in Brothers Are Monsters), though neither he, his character nor that episode appeared anywhere on the video. 9. This special also serves as a pilot for a future spinoff featuring The Carmichaels. However, plans to make this spinoff into a series have been shelved. The reason being is that there are plans to make All Growed Up and Preschool Daze into series. The tweenage Susie will be part of All Growed Up, while the toddler Susie will be part of Preschool Daze, along with the main Rugrats series, which is expected to remain in production, alongside the 2 new series. If The Carmichaels went to series, the plan was to move the family to Atlanta, where they apparently have relatives. Klasky-Csupo and Nick have decided not to pursue The Carmichaels any further, as the only way The Carmichaels would work is if Preschool Daze didn't become a series, and if Susie leaves the main Rugrats series (if the series wasn't cancelled, which now seems unlikely). There were plans to make The Carmichaels into a series as early as the 1999-2000 TV season, but plans involving the toddler Rugrats had put the new series' plans on ice. 10. This episode is also an educational Rugrats episode, at least by Nick's terms. This episode was showcased in Nick's early-morning (6AM ET) Cable In The Classroom line-up in this episode's first year of broadcast, 2001. For more on Nick's educational TV efforts, click here. 11. Then again, this episode would only serve as a basic introduction to Kwanzaa -- only the first day, "Umoja", or "Unity", was covered, and there are 7 days of Kwanzaa -- the others are Kujichagulia (Self-Determination), Ujima (Collective Work and Responsibility), Ujamaa (Cooperative Economics), Nia (Purpose), Kuumba (Creativity), and Imani (Faith). 12. In an Associated Press article on this special, released to papers the week of 12/13/2001, Irma P. Hall, who was 66 when this episode was first telecasted, has celebrated Kwanzaa with her kids in the 1960s, as the secular holiday does not present religious conflicts. She also makes it a point to introduce Kwanzaa to those who aren't black. She says, "One thing that [the 9/11/2001 terrorist attacks] taught us is that we really need to know as much as possible about other people's cultures... getting to know about all these different holidays that people celebrate, it helps to reinforce the fact that we are more alike than different." 13. For more information on Kwanzaa, visit "The Official Kwanzaa Web Site", established by Dr. Maulana Karenga, the founder of Kwanzaa. In this 60-minute episode, produced in celebration of the Rugrats' 10th anniversary, the Rugrats watch a movie on TV, where some scientists go into the future. The movie, unfortunately, was interrupted with a special presentation of Angelica singing on her new karaoke machine. Of course, when they wanted to play with her machine, she wouldn't let them. The only way to escape her tirades is to go into the future. So, our favorite babies hitch a ride in Tommy's time machine, made of a deflated basketball, a jump rope, and a purloined karaoke machine, to ten years into the future, where the Rugrats become pre-teens (except for Angelica, who will actually be a teenager). After they turned older, the now-former Rugrats get ready to attend their first concert, headlined by teen sensation "Emica" (voiced by Adrienne Frantz). Meanwhile, Stu and Didi, also ten years older, participate in a "Dinosaurs of Disco" dance contest, with Stu's disco medallion acting as a good luck charm, for him and Angelica. 1. The concept of Tommy's time machine was originally introduced in the Rugrats Files line of books. 2. Speaking of "time machine", the interior of the time machine in the movie is similar to TARDIS, which is the time machine used by Doctor Who. 3. Apparently, the Rugrats adjust to pre-teen life very quickly -- they do not act like babies at all in the future, once they're there. Not to mention, that Angelica already has a friend (named Samantha Shane (voiced by Larraine Newman), who may be the same person as the one in Opposites Attract), and another idol besides Cynthia (Emica). On the other hand, some things remain the same, besides the fact that they're all still friends -- Phil & Lil still like gross stuff, while Chuckie, now with braces and looking as geekish as ever, still goes around with untied shoes. 4. As for the adults -- Stu's hair is shorter and is now wearing glasses. Didi's hair also got shorter; it also turned pink and it now has a white streak. Grandpa, now a school bus driver, looked a little older. Everyone else looked the same as they did ten years earlier. As for Kira, she did not appear in the episode, but will still be around -- Chazz mentioned that she couldn't make it. Lulu, also a no-show, will still be alive and kicking in the future -- Grandpa mentioned that she was on vacation in Egypt at the time. As for Howard, he'll be convalescing at home -- he hurt himself while practising for the dance. 5. Spike will be very elderly (for a dog) -- he'll be in his 90s in dog years (which will put him at 13 or 14 years old in people years). Spike will also be large and fat, caused by being fed table scraps all those years. 6. Also in the future, the Carmichaels will still be Stu & Didi's neighbors. More imporantly, Susie will now be a babysitter. More specifically, Tommy & Dil's babysitter. Pretty odd for a Rugrat to babysit a younger Rugrat. 7. There were also some rumors flying around regarding the other details of this special, such as some of the tweenage Rugrats having a steady boyfriend or girlfriend. Accounding to the The Asian Rugrat website, Tommy will have a girlfriend named Hannah, while Angelica has her own boyfriend -- Dean (yes, the same "Dean" from Angelica's In Love, only 10 years older like the rest). Also, Spike & Fifi would have a family, and Timmy McNulty would be a football player. Of course, none of these would happen (though Spike & Fifi's family did happen in a later episode, Bow Wow Wedding Vows). But if this special becomes a series, you never know. 8. In the future, the Rugrats will be attending Jim Jr. Jr. High School. Except for the older Angelica and the younger Dil, they'll be attending at least one class together -- a science class taught by Mrs. Guppy (voiced by Monica Piper). 9. The science experiment conducted by Tommy, involving a pickle and electric current, is a real experiment that you can do at home with your parents. For instructions, click here. Fair warning: the experiment in the episode involved electric current from a battery, which can be 6 volts to 12 volts DC, but the experiment on this page involves house current, which range from 115 volts to 240 volts AC, depending on where you live, which can be quite dangerous if the experiment is done improperly. 10. Stu's disco medallion has a design of a scorpion on it. In astrology, the scorpion symbolises the "scorpio" sign -- the astrology sign for people born on or between October 24 and November 21. What's just as interesting is that later in the episode, at the dance contest, Didi mentions to Stu that he's a "libra" -- represented by scales, libras are people born on or between September 23 and October 23. Didi goes on to say that Stu is a "libra-scorpio cusp", which means that Stu's birthday was near the final days of the libra period. This means that Stu's birthday is anytime between October 21 and October 23. Given that he was born during the Eisenhower era, around 1958 (as we found out in Sour Pickles), he would actually be 42, going on 43, when this episode aired in 2001. Where storylines go, considering the fact that he's always 35 years old (as per The Legend of Satchmo) and the toddler Rugrats are always that their ages, he'll be about 45 years old when the events in this episode takes place. And as for Didi, she'll be roughly the same age as Stu. I should also mention that during the disco era of the 1970s, everybody was asking "What's your sign?" 11. Near the end of the episode, where Angelica introduced Chuckie to Samantha, she introduced Chuckie as "Charlie Finster III". Does this mean that there's more than one Chuckie or Chazz in the Finster family tree? 12. Also, ten years from "now", it'll probably be apparent that Gilligan's Island would still be popular -- a snippet of that show's incidental music (the one that is usually heard at the end of the episode) can be heard during the cafeteria scene, after Phil said that spaghetti reminded him of his childhood. 13. For those who wonder why all the Rugrats go to the same school, even though Dil is only 10, an explanation is in order -- it's not entirely because the producers wanted all the Rugrats to go to the same school, because in some school districts, that's how it works. Some school districts have junior high, or middle, school cover grades 5 to 8, which is, relatively, ages 10 to 14. In some parts of the country, junior high covers grades 6 to 8, or 6 to 9, or 7 to 9. Also, some rural school boards don't have middle school -- in those places, elementary school goes to grades 5, 6, 7 or 8, with high school starting at the next grade -- 6, 7, 8 or 9. 14. During the flashback sequence at the Emica concert, there were clips from past episodes of Rugrats in the last 10 years, which was played during a largely-instrumental portion of the song that Emica, Angelica & Tommy sung. During this sequence, has anyone noticed how bad the video was? The episodes themselves have better picture quality than the clips in this sequence. In my opinion, considering the importancy of this episode, the flashback sequence was better off during the scene where the Rugrats gather at the sandbox (after Tommy got grounded). And a better choice of flashback music would be, of course, The Beatles' "Yesterday". 15. Back in the "now", the song that Angelica sung on her karaoke machine was her version of "America The Beautiful", the same song she sung in Vacation, with the line "Angelica, Angelica..." used in both episodes. 16. Also, while she was talking to the Rugrats before her song, the sci-fi movie went to commercial. The commercial shown was the "Chocolate Cheese Bar" ad, first seen in the Chuckie's Complaint episode. 17. Overracting dept. : don't you think Angelica is acting a little too angry when the Rugrats took her karaoke machine? Also, don't you think Stu and Didi are overreacting when they cried after grounding Tommy? 18. Larraine Newman, the voice of Samantha, was best known as a cast member of Saturday Night Live during the "Not Ready For Prime Time Players" days, 1975-80. Currently, she's the voice of nurse Lois Foutley, Ginger's mother, on another Klasky Csupo Nicktoon, As Told By Ginger. 19. Adrienne Frantz, who voiced Emica, is best known as a regular on the CBS daytime soap, The Bold And The Beautiful. 20. Once again, there will be different sets of numbers issued by Nick for this episode -- Nickelodeon has numbered it "993" for the 60-minute special; "141" for part 1 and "142" for part 2. 21. Speaking of "parts", the video version is actually divided in 2 parts, with each part having its own set of title cards and writer / music / director credits, plus a "To Be Continued" notice at the end of the first part, which ends when Tommy agreed to give Angelica Stu's disco medallion. In the televised version on Nick, the entire 60-minute program was a single part, with only one set of title cards and WMD credits. 22. The commercial structure, if the special was broken in two, would be similar to the format used in Acorn Nuts and Diapey Butts. 23. When this special first aired on Nick, it was not only the higest-rated Rugrats episode ever, it was also the highest-rated Nickelodeon program ever, as well as the second-highest rated program on cable in 2001 (up to that point). For a more detailled look at the ratings, as well as those tweenage Rugrats that made it happen, click here. 24. In countries where this episode is seen in 2 parts, the second part begins with a brief recap of the first part. This is seen between the title card and the first scene. 25. This pilot was nominated for the "Outstanding Children's Program" category in the 2002 Creative Arts Emmy Awards, which will be awarded Saturday, 9/14/2002. 26. Most importantly, this episode also serves as a pilot to the new "All Grown Up" spinoff, slated to debut in 2003 on Nick US. It was to have used the same name as the pilot, but, in November 2002, Nick has decided that the name of the spinoff should be more gramatically-correct. Do you know what All In The Family, Mary Tyler Moore, Happy Days, The Simpsons and Rugrats have in common? They all had special retrospective shows. Narrated by Nick star Amanda Bynes, this half-hour documentary, produced in celebration of their 10th anniversary, will take a look inside America's favorite TV babies, and explain how they tick. Like other retrospectives of other TV classics, the special will feature favorite clips from past shows, interesting trivia, testimonials from fans, and chats with the producers, staffers and voices of the show. 1. Did you know that Chuckie's hair and glasses are based on the looks of Mark Mothersbaugh, the Rugrats' music man? Also, did you know that Meet The Carmichaels first aired on January 10, 1993? After seeing this documentary, now you know. 2. Also, for those who don't know, the languages featured in the international Rugrats clips were French, Spanish and Japanese. You had to listen close and have a basic knowledge of what the language sounds like, as the languages weren't labelled in the documentary, though the French clip was a dead giveaway, as it was accompanied with the end of the Les Razmoket title sequence. 3. Strangely, Christine Cavanaugh and Tara Strong, the voices of Chuckie and Dil, respectively, were not featured in the documentary. Apparently, the testimonials of the voices of the Rugrats were taped during a recording session that did not involve Chuckie or Dil at the time, as the documentary also featured a recording session in action. It should also be noted that Tara Strong usually records her Dil voices separately, as Dil's voice may be annoying to some cast members.